body shops throughout Southern California! Why do dozens of dealerships throughout Southern California choose Wheel Cosmo? We offer auto dealers and body shops quality and value without compromise. Our family owned and operated business is focused on the satisfaction of each and every valued customer. Our team will go the extra mile to make your wheels and business shine! Mobile repair on-site - our team can straighten and refinish wheels on location the same days. No job or dealership too big or small. We stocks thousands of wheels for all makes and models. 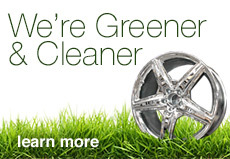 We're the greenest wheel repair shop in town! The cutting edge tools and technology at our shop are more than 85% powered by clean solar energy.